Do you know those characters who show up for a quick romance and are never seen again after it's over? Honestly, we often forget that the relationship ever happened. Not all TV characters need to talk all the time, in fact, there are a few that we would really appreciate hearing less of at least for a small while. No matter what fandom you're in, people are always going to like different things. Mostly. We put together a list of ships that are universally loved by fans! Did you ever wonder what your favorite show would be like without a certain character? More enjoyable probably tops the list. Here are 19 who need to take a hike! Oddly, some of the most romantic moments happen when characters think they're about to die. Check out 19 kisses that took place during dire circumstances. Has your favorite TV couple ever gone through so much angst you felt like you were going through all the pain with them? Here's 21 times it happened to us. Calling all Shadowhunters Fanatics! Let's gather together and swoon for Simon Lewis as we think about the qualities he possesses that makes him great boyfriend material! They may not be the show's main focus, but that doesn't mean they're not ours. What's a secondary romance on television that went above and beyond for you? All female characters bring something special and unique to their respective series. Check out our list of antagonistic ladies we just can't help but love! Will they/won't they couples are great, but every TV lover needs that one ship they can always count on. Check out 21 of the most secure relationships on television! Getting to see TV characters looking at someone they are crushing on with a hint of heartbreak shouldn't be as exciting as it ends up becoming. 9 Best Malec Kisses Picked by Shadowhunters' Fans!! We just couldn't narrow this list down ourselves. We took to Twitter and asked the Shadowhunters fandom what their favorite Malec kisses were. Here's what they said. If anyone catches us, we're dead. Permalink: If anyone catches us, we're dead. Jonathan: I've spent years clinging to my memories of freedom, imagining what I'd feel when I finally made it back. Would I be happy? Angry? As hard as I tried, I could never quite picture it. In the end I felt nothing, just the unforgiving cold of the winter air. Jonathan: I guess it's true what they say. You can never go back home. Permalink: I guess it's true what they say. You can never go back home. Shadowhunters Season 3 Episode 19 Preview: Can Jace Pull Clary Back From the Edge? 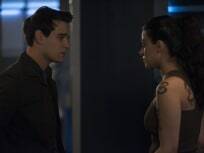 Shadowhunters Sneak Peek: Simon and Izzy Team Up! Shadowhunters Season 3B Trailer: Who's Getting Married??? Shadowhunters Season 3 Episode 19: "Aku Cinta Kamu"
Shadowhunters Review: Did That Breakup Just Happen? !